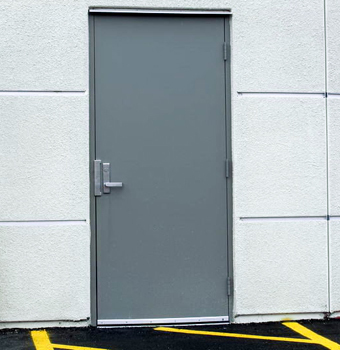 Barrier Integrated Systems special performance custom built bullet resistant security doors are available in various configurations and materials to meet multiple high performance characteristics. Our bullet resistant security doors can be used in government and corporate offices, banks, prisons, courtrooms, safe rooms and any place where ballistic and attack resistant security is required. Our security experts at Barrier Integrated Systems will help you specify the perfect bullet resistant doors for your door assembly. All our doors are also blast, fire and forced entry resistant. Some of the capabilities of our security doors are ballistic resistance UL Level 8, blast resistance 29 psi, UL fire rating 3 hour, 90 minute, and 450 degree temperature rate of rise. These security doors also pass ASTM1450-12a (door assembly impact load test, door static load test, door rack test, and door edge crush test). Our bullet resistant doors are designed, engineered, and fabricated with custom multipoint locking hardware to meet your special safety requirements. Call us at 302.502.2727 for more information on our security products. Barrier Integrated Systems is a ballistic, blast and forced entry protection security door company that specializes in highly durable bullet resistant, blast resistant and fire-rated doors, for a variety of security functions. Our custom built security doors are forced-entry, ballistic and blast resistant, and UL fire-rated. We will also offer specialized hardware for assembly of our ballistic doors, as well as certified installation services. Contact us at 302.502.2727 for more information regarding our security door company. Copyright © Barrier Integrated Systems (BIS). All rights reserved.